Searching for the best latest countdown app apk for your iPhone? I’m so much glad to be of help to you. In this article I will be introducing you to the 5 best iPhone apps which are used in setting reminders and countdowns. Take for instance you have an event which is going to be happening in just few months to come. Obviously it’s normal for human being to forget something’s, since human beings are not machines or computer. Therefore, for you not to forget an important occasion in your life, you need to have this app on your iPhone. It’s now left to you to choose any of these best reminder apps for iOS according to your needs. 1. Checkmark reminder app: If you’re in need of a location based reminder app for your iPhone, then I will thereby recommend Checkmark reminder app. Checkmark reminder app is a very good reminder app for iPhone. It’s very much easy to set reminder with Checkmark reminder app. 2. Due reusable egg timers reminder app: This app is one of the best reminder apps for iPhones as well as iPads. It has all features that make it a complete reminder app for iPhone and iPad users and it’s very much simple to use unlike other reminder. Aside from been simple it also has some features like repeating alarms and as well restoring databases and lot more. 3. Any.DO: This app enables you to add files as well as note. The most encouraging part of this app is that it cooperates with other reminder apps for iPhone. It’s a well-known reminder app in the apple app store which enables you to manage personal and family tasks as well as official programs. 4. Clear Tasks app: This app is designed to delete unwanted reminders on your iPhone. For example past events are been deleted by this amazing app. It’s available for downloads in apple apps store for different versions of iOS. 5. Countdown calendar reminder app: This application is an iPhone app which enables you to add the information of your reminder with ease for example title of your reminder, date and time. This application is the best of all reminder apps because; it will start counting down from the day you create the reminder until the exact day you assign. You can get this app downloaded from apple apps store. Note: There are many best reminder application for iPhone users. This are just tips of the ice bag. 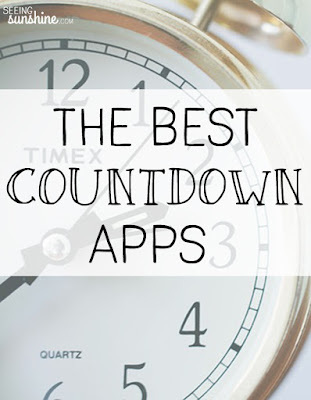 But never the less, getting the best countdown app for your iPhone is one of the right things to do: reason is that with reminders you will not miss important events such as wedding anniversary, family meetings, official appointments, friends programs and family programs etc. By now you should be conversant with the 5 Best iPhone Apps for Setting Reminder and Countdown. It’s now left for you to make your choice. after that check Nomao Camera app. Thanks and stay tuned for more helpful articles.